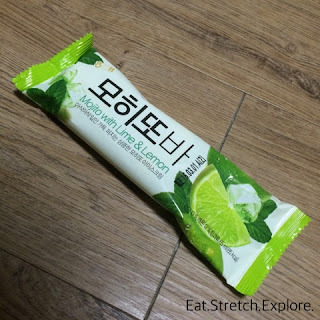 There are now Mojito Bars in Korean convenience stores! Convenience store ice cream/summer treats in Korea! These contain no dairy, so they're lactose-free for all of you fellow lactose-intolerant people out there. I was really craving a popsicle the other day. It is actually quite hard to find one here, which is really disappointing. This bar is really refreshing. I was really craving a cool treat and was about to eat an ice cream bar and live with the potential consequences when I found this bar. They are currently on sale for 2+1 at CU, just so you know. There is no alcohol in it, if you're worried about that. The lemon-lime flavor is stronger than that of a Sprite or cider. I, personally, thought the lime flavor was stronger, but maybe that is just me. My go-to ice cream used to be the 돼지바 (the pig bar), but this is now my new favorite. What's your favorite cool treat from the convenience store?